I grew up deer hunting whitetails in Georgia and we didn’t get much snow and I never got to hunt in it. Well I moved to Kansas and all that changed. The snow has arrived here in Kansas and it got me thinking about the whitetails and how they survive the tough winter conditions. 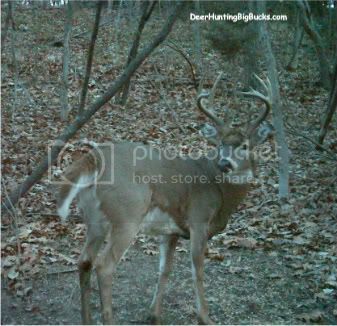 The bucks have to gain the weight they lost during the rut and the does that are pregnant must feed two. I think that’s why it is important to have a herd that is within the carrying capacity of the land, to make sure there is enough food for them to survive and be healthy. 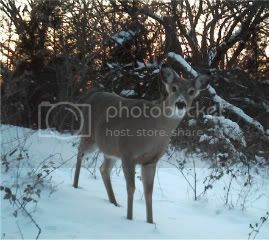 And the way to have a herd within the carrying capacity is to balance the herd with a 1 buck to 1 doe ratio being ideal. If you have more does than bucks all the does won’t be bred during the peak of the rut and that will cause a lot of fawns to be born later and they possibly won’t be mature enough to make the following winter and would be more likely to be at risk to predators, and you will end up with more and more does every year and the herd will be over the carrying capacity of the land. So it is important to shoot some does when deer hunting. It will keep your herd healthy, and they taste really good on the grill. Whitetails need quality late season food sources to survive the harsh winter conditions. I have been in Kansas for almost three years now and being from the south I had never seen any whitetails that were starving to death but I saw a young doe last winter that was laying in the snow starving to death and it is not pretty. I know the old saying “only the strong survive” but it was sad. I have a deer hunting honey hole behind my house and during the cold winter months I like to keep corn out back there to help the whitetails. It can get expensive but I feed them when I can. Food plots and supplemental feeding or having agriculture crops late in the season can tremendously help the overall health of the herd along with balancing the buck to doe ratio. Click the following link for more information onuality deer management. Tagged whitetails. Bookmark the permalink. Good post. You may want to check out our game management area PinOak in Bogard, MO for great Deet, Turkey and up-land bird hunting. I was interested in hunting, would deer be a good way to start? My cousins hunt all the time and they started with deer so I figured it would be a good start. Deer hunting would be a great start! I have never been on a guided hunt Christopher. My advice would be get a big one! Great Post! We don’t get too much snow down here in south Texas. But I too have seen a deer starve to death and your right it’s not a pretty site. Thanks for the post. Nice article. Keep working, splendid job! nice﻿ looking. Thanks Michael! I appreciate you stopping by.